Donald Trump Engagement Ring Auction for a Emerald Step Cut Diamond Platinum Engagement Ring previously given to Marla Maples. The Donald Trump engagement ring auction for a emerald step cut diamond platinum engagement ring previously given to Marla Maples is now up for auction. The businessman-turned-polarizing-presidential-candidate Donald Trump engagement ring auction is for the ring that he gave to Marla Maples in 1991 will hit the auction block for a second time. It’s expected to go for $300,000, nearly three times what it garnered the first time it went up for auction. 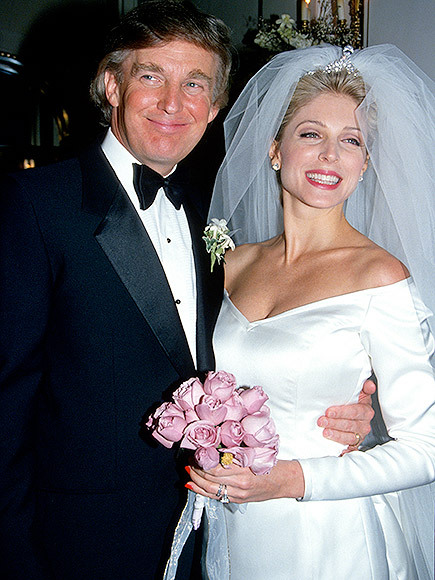 Emerald Step Cut Diamond Platinum Engagement Ring at Donald Trump and Marla Maples 1991 Wedding. Ziamond Cubic Zirconia Jewelers offers an affordable option to the stunning Maples Trump Emerald Step Cut Diamond Platinum Engagement Ring, by Harry Winston, presented to Marla Maples. Our Emerald Step Cut Cubic Zirconia Channel Set Baguette Solitaire Engagement Ring Series is available with a 1.5 carat, 2.5 carat and a 4 carat center stone. Larger emerald step cut simulated diamond cubic zirconia center stone carat sizes are available, in addition to your choice of solid 14k yellow gold, 14k white gold, 14k rose gold and luxurious platinum, via special order. The Emerald Step Cut Channel Set Baguette Solitaire Engagement Ring Series can also be made as a bridal set with a matching band that includes tapered or graduated baguettes that beautifully compliments the simulated diamond emerald step cut solitaire. Ziamond Emerald Step Cut Cubic Zirconia Engagement Ring and Wedding Band. Ziamond Cubic Zirconia Jewelers features the finest hand cut and hand polished original Russian formula cubic zirconia coupled with a solid gold or platinum mounting. All mountings are the same high quality mountings used in top jewelry houses. You can achieve the same look for a fraction of the cost Donald Trump originally spent on the engagement ring that is now auctioned, in addition to its increased estimated worth in today’s market. No one will know the difference! Update! The Donald Trump Engagement ring auction for the ring given to Marla Maples fetched $300,000 as previously estimated! This entry was posted in Celebrity, cubic zirconia, Custom Jewelry, cz, Diamonds, Engagement, Platinum, Uncategorized, Wedding and tagged 1993, auction, Auctions, Big Diamonds, december, diamond, donald, Donald Trump, engagement ring, Everyday Money, getty, jewelry, maples, marla, Marla Maples, married, MONEY, platinum, ring, trump, wedding on June 8, 2016 by Victoria Foster.